Suresh Soni, RSS’s point person with the BJP, who facilitated ‘anointment’ of fellow Pracharak as PM candidate last year and smoothly engineered the marginalisation of the senior Advani and proved his clout within the organisation, is in news these days albeit for wrong reasons. News has come in that he along with his former supremo (the late) K S Sudarshan were also beneficiaries of the yet unfolding MPEB scam which has already claimed the head of a senior minister – another fellow Pracharak - in Shivraj Singh Chauhan’s cabinet. Laxmikant Sharma, the said minister, who earlier handled important portfolios like mining, culture, human resources had claimed at the time of his arrest that he has been made a sacrificial lamb and when time comes he would also ‘reveal the truth’.He allegedly facilitated appointment of Mihir, a personal assistant to the late Sudarshan, as a ‘Nap Taul Inspector’ at the behest of Suresh Soni. Fingers have also been pointed towards Chief Minister and his wife and the manner of appointment of CM’s own niece has also come under cloud. The gravity of the situation could be imagined from the fact that Chauhan had to rush to Delhi – cancelling all his appointments – and meet top RSS leaders as well as party bosses to explain the unfolding situation. While there has been official denial by the Police Headquarters about involvement of any ‘RSS leaders’ – sceptics have noted that it has no direct locus standi in the whole case as the investigation is being handled by Special Task Force (STF) under the direct supervision of the High Court. Mihir is right now in police custody, along with scores of other beneficiaries of the scam, the STF has duly recorded his statement and is conducting further enquiries. Looking at the ambit of the scam – which according to Ms Uma Bharati, ex-Chief Minister of the state is ‘bigger in magnitude than Bihar’s fodder scam’- and new revelations coming to the fore daily- one thing is sure that final word has not been said about it. 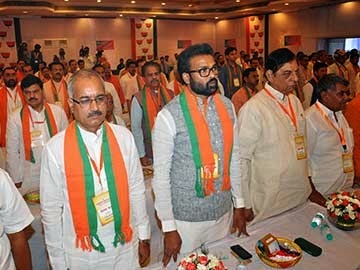 Close on the heels of these fast paced developments, Suresh Soni broached another controversy by his utterances while addressing 161 first time BJP MPs at a two-day training camp organised by the Party at Surajkund near Delhi. He has compared BJP’s recent electoral victory with India’s freedom struggle. It is disturbing to note that forget condemnation of this weird statement nobody questioned this open denigration of the heroic freedom struggle waged by people of the subcontinent, by a very senior member of the very organisation whose most famous activist is at present PM of the country. Was it just a ‘slip of tongue’ as it is normally claimed after all such statements which provoke reaction from different quarters or Mr Soni was making a statement of facts as per his own world view was concerned? Any sane person knows the difference between people fighting for independence against foreign intruders or occupiers which is normally a long drawn struggle and involves tremendous sacrifices and periodic elections to choose the party or a coalition of parties to hold the reins of the government. It would be foolish to claim that Mr Soni does not have enough wisdom to differentiate between the two. Then why did he make such an outrageous comparison? Firstly, inadvertently or so he was giving vent to RSS’s sense of tremendous rejoice over the fact that one of their disciplined Swayamsevaks has reached the topmost post in the country and with this electoral victory ‘fetters’ over their project of building a Hindu Rashtra have been removed. The recent elections to the Lok Sabha have in fact radically changed the picture in their favour. With the seculars and the leftists being pushed to the margins electorally, and the emergence of a ‘Hindu vote bank’ in their favour cutting across regions and castes, the RSS as well as the plethora of affiliated organisations know very well that they can now move fast forward on their agenda. One need not go into the details of the majoritarian nature of this mandate in their favour which is also evident in the fact that they do not have a single member of Parliament from the biggest minority community in the country in the lower house and out of the 282 M.P.s elected to the parliament only two belong to other minority communities. It also happens to be the Parliament where the proportion of Muslims – the biggest minority community here – is at the lowest. Secondly, this statement also resonates with their essential concealed disdain towards the anti-colonial struggle of the Indian people which according to them brought to power ‘pseudo seculars’ and their allies and did great harm to the cause of Hindu nation.Instances galore which show how its’ founders ridiculed the martyrs and made fun of people’s struggle. Patriotism is not only going to prison. It is not correct to be carried away by such superficial patriotism. ( CP Bhishikar, SanghavarikshKeBeej: Dr.Keshavrao Hedgewar, Suruchi, 1994, p. 21. Thirdly, any student of the independence struggle knows that it is a ‘weak point’ as far as Hindutva formations in general or RSS in particular are concerned. Much has been written on the fact that not only RSS did not participate in that struggle and focussed itself on ‘organising Hindus’ and but it even deterred its own activists from joining it. In fact, RSS played such an ignoble role during that tumultuous period that today they find it difficult to defend themselves over their inaction. To save themselves from such discomforting questions they either engage in ‘picking someone from that period’ show her/his proximity with the ideals of Hindutva or to denigrate that period or devalue the great martyrs..
History bears witness to the fact that from the days of the heroic struggle led by the legendary Tilaka Majhi (1757 A.D.) to the historic ‘Quit India movement’ (1942) or the Royal Indian Navy Strike (1946) the nearly 200 years of British rule in India always met with resistance at different levels led by different forces. The first half of the twentieth century witnessed the coalescence of different anti-British forces under the Congress banner or the emergence of the Communist movement as well as the revolutionary movement led by the likes of Bhagat Singh, Chandrasekhar Azad which posed a serious challenge to the colonial rule. The emergence of Indian National Army under the leadership of Subhash Chandra Bose which delivered mighty blows to the Britishcolonialists is another glorious chapter of that period. All these developments and the growing aspirations of the Indian people to get rid of the colonial yoke could not impel the Hindutva leaders to join the struggle. Interestingly there is a strong commonality between the Hindu communalists as well as the Muslim communalists. Neither the Hindu Communalists led by the likes of Savarkar and Golwalkar nor the Muslim communalists led by the likes of Jinnah participated in ‘Quit India’ movement. Their support to the British rule also becomes evident when one witnesses that it was the same period when Hindu Mahasabha was running coalition governments in Bengal and parts of today’s Pakistan with Muslim league. (see here) While Shyama Prasad Mukherjee, then leader of Hindu Mahasabha was a senior minister in Shahid Surhawardy led government, his party Supremo Savarkar was on a whirlwind tour of the country holding public meetings and appealing the youth to join the imperial British army with a slogan ‘Militarise Hinduism and Hinduise nation’. At this juncture one can never forget the fact that the very idea of ‘Hindus’ as a separate nation or ‘Muslims as a separate nation’ emerged and evolved during the colonial period only. In fact, it was mere extrapolation of the understanding of subcontinent’s history constructed and popularised by the colonial masters and their intellectuals. In a nutshell, the colonials divided the subcontinent’s history broadly into three periods : Hindu period, Muslim period and British period. It was not only factually incorrect – which tried to obliterate the role played Buddhism and various Buddhist, Jain rulers etc. – but also conveyed an impression that the Hindus and the Muslims were in permanent conflict before the advent of the Britishers discounting the emergence of composite heritage in this part of South Asia. Lastly, by elevating the day ten year Congress led UPA government ended to the day ‘Britishers left’ the RSS strongman not only wanted to enthuse the Hindutva cadres but also wanted to send out a signal to them that they should not rest till the final goal is achieved.